Our compensation is exclusively from our clients. 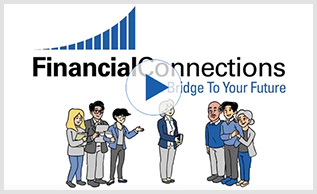 Financial Connections is a fee-only firm. We accept no commissions or any other compensation from any of the investments we recommend. We are fiduciaries – putting our client’s interest first. We will be your first stop for any financial questions. Think of us as your resource library. If desired meeting annually with your adult children. Our fee is an annual retainer, depending on the complexity of your situation. Investments: How are you invested now? Is it aligned with your future goals? Retirement/transition planning: Where are you today? Is it consistent with your goals? Withdrawal: How do you replace your paycheck in retirement? Rollovers: Should you rollover your 401(k) plan? Pensions: Should you receive monthly income or roll the balance to an IRA? At the end of your financial plan, we will include a list of Next Steps to take. If you would like our help working with you to implement the plan recommendations, we will provide a quarterly “To Do” list for us to work on together. It will be a fixed fee, based on activities required. We offer two investment services. Customized investment portfolio – designed as the next step after your financial plan. We create a portfolio for your circumstances that takes into account tax issues, risk tolerance and timeframe. Also included is your personal website. Minimum investment $750,000. What is Financial Connections’ approach to customized portfolios? We use a combination of passive (index style) and active (stock selection) investments. We view this as part of diversification. Depending upon your stage of life and what the portfolio needs to do for you, we review volatility (market fluctuations), distribution requirements and years of growth available to absorb market downturns. What primary mutual fund companies do you use in your customized portfolios? Dimensional Funds Advisors (DFA), Vanguard and T. Rowe Price. We prefer these companies because of their corporate culture, low expenses in their mutual funds and the longevity and quality of the fund managers.